Italy is a magical place, and at the beginning of my study abroad adventure, I never truly thought I would be able to call Rome home. For the past two months, I have been living in Trastevere and going to school in Campo de Fiori. The campo during the day is a lively place with everything you could ever need: fruit, veggies, oils, wine, and clothes. Trastevere is just 10 minutes away by bridge. The bridge takes you over the Tiber River, and is constantly filled with vendors, tourists, and people playing live music. Walking across the bridge is one of my favorite moments of my day; beautiful day or night in different ways. Rome is a place where history is in every corner, every little shop, and every piazza you encounter. Today we took a guided tour of our neighborhoods, and learned so much about the things we pass every day. Some highlights from the tour were walking around the Jewish ghetto area, and learning the background history of the Campo. 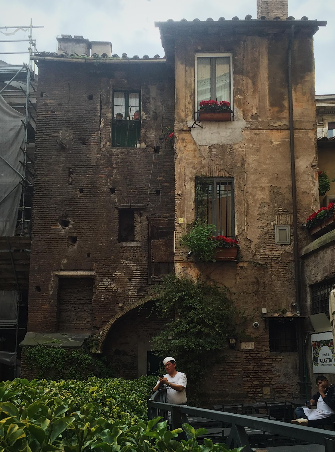 Part of the Jewish ghetto is currently under restoration, but the old building and what is left of the structures is so cool. I walked through this neighborhood during my first weekend in Rome, and it was nice to understand the context of what I passed by when I first arrived. Our tour guide explained that up until 10 years ago, there was only the original bakery and one restaurant in the area. Since then, commercialization has taken off and the campo has become a place where people can go out to eat, grab coffee, and socialize in the piazza with their neighbors. We also walked around the Campo and learned about the background history of the piazza. The Campo was once a square where public executions took place, which is crazy to think about because we walk through it every day and are greeted every day by people working in the market; yet the history of the area is not a happy one. We talked about Giordano Bruno, who was burnt alive in the square. His statue is still there today and he is still a symbol of freethinking, and often times there is flowers laid on his statue. This part of the tour was particularly special to me because I learned the significance of the space and it makes me appreciate it more, knowing that Bruno was a very important part of history. This statue is also near and dear to my heart because of the special memories that I have made with people in my program; the statue is one of our favorite places to hang out together in the campo. Whether it is eating a Panini during lunchtime, or hanging out there at night, the statue will always be special to me. Taking this walking tour reaffirmed my love and respect for Rome, and the neighborhoods I have been lucky enough to call home, more than ever before. I hope that one day when I am older and have graduated from UW, I can come back to the Campo, or walk through the little streets in Trastevere and reflect back on all the good memories I made here in such a short time. 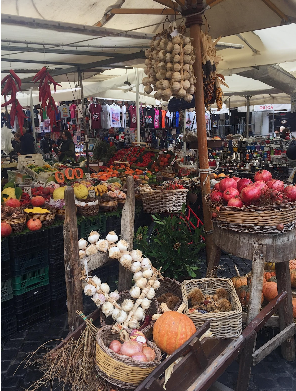 Located in the heart of the city is Campo de’Fiori, one of the oldest markets in Rome. These markets are found in all 22 rionis, or districts, of Rome. For centuries, these markets have been located in a piazza, a gathering place where people would congregate and socialize. Every morning, I wake up to see the vendors setting up their large white tents, some spices, and produce already out on display. Men work to unload the trucks parked nearby. By the time I finish class, the market is in full swing. Locals and tourists alike are browsing the many stalls that fill the large piazza, surrounding the statue of Giordano Bruno—notable for his cosmological theories and his significance to the history of free thought. Multiple times a day, I pass by the same restaurants with the same hosts trying to lure us in. In fact, I pass by so often that I end up in conversations with the hosts who sometimes teach me a few Italian words here and there. Since I have been living here for two months now, I was initially unimpressed when it was announced that we would be going on a walking tour of the area. I thought I knew the streets inside and out, and I thought that there was not much else to see. I was wrong. We walked down familiar streets only to suddenly turn into alleys and places that I never noticed before. We saw a palace courtyard full of statues, a stone fountain located behind a modern art museum, and a delicious-looking pastry shop famous for their almond desserts. Our guide recommended the cassata, a traditional Sicilian sponge cake layered with ricotta cheese. Needless to say, I added it to my growing list of eateries to visit in my last two weeks in Rome. One of the somewhat somber yet most impactful parts of the tour was walking through the Jewish Ghetto. I really liked the way our guide stated that the ghetto is a reminder of an important time in Roman history. Now it serves as a physical reminder of the struggles the Jews faced in Rome, most notably the prejudice they survived with fervor. Although the Jews were given a part of the city that flooded often, destroying their shops, they simply rebuilt their shops and kept going. When they were given only the worst artichokes, they fried it and now it is one of the most famous dishes in Rome today. The persistence and optimism of the Jews even in the worst of times is truly an inspiration to us all. In many ways, my perception of the Campo de’Fiori area has changed. I feel like I see the city in a new light, and will now aim to re-examine familiar places to see if there was something I had been missing all along. For two more weeks, I will explore every corner and secret pathway I can find, and then perhaps I will chance upon another hidden piece of history.